Exploring beyond traditional concepts, we use inorganic and organic chemistry to synthesize new functional molecules and materials, and investigate their structures, properties, and applications. Our main research interest is the elucidation of the similarities and differences in structures and the reactivity between organic compounds and the corresponding heavier congeners. 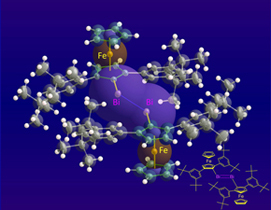 These studies are interesting and important from the standpoints of not only fundamental chemistry but also paving the way to more extensive applications of main group chemistry. Fundamental studies are conducted on design, synthesis, and elucidation of the structure and properties of molecules and systems, which have entirely novel π-conjugated structures. Current projects include “open-cage fullerenes and their encapsulation of guests”, “functional π-systems with interesting photo- and electrochemical properties for electronic devices”, “π-conjugated molecules having heteroatoms”, and “hybrid organic-inorganic materials”. Research in this laboratory focuses on molecular chirality and molecular recognition. 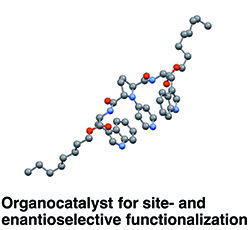 Programs are active in the areas of asymmetric synthesis based on memory of chirality, site-selective functionalization by organo- and hybrid catalysis, catalytic asymmetric synthesis of supramolecules, remote asymmetric induction, and total synthesis of natural glycosides by site-selective functionalization. 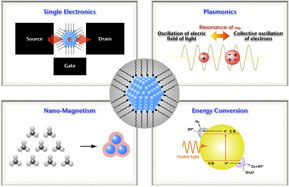 We are developing novel inorganic nanoparticles for high-performance nanodevices (single electron transistor, plasmon waveguide, nanocomposite magnet) and photo-energy conversion (water splitting, solar cell) by controlling the primary (size, shape, composition, etc.) and secondary (spatial arrangement) structures of nanoparticles.